1 piece of Multi-density fiber board (MDF)- 2 feet by three feet and ¾ inch thickness. (Have the hardware store cut this piece lengthwise into two, 3 foot high pieces measuring 1 foot across. )These will be used for the sides of the shelf. Nails. (We used nails for this project but you might want to use screws instead to make it a little sturdier). Sand all of the wood to remove any rough edges. Start by pre-drilling holes into the 4, 1x3x2 inch pieces of board. Drill holes into the face of the board; one on each end and one in the center, all along the edge of the board. Begin making the first shelf by nailing one of the predrilled pieces of 1x3x2 wood to the 1 inch edge of a 1x2x2. Then do the same thing for each of the other shelves. 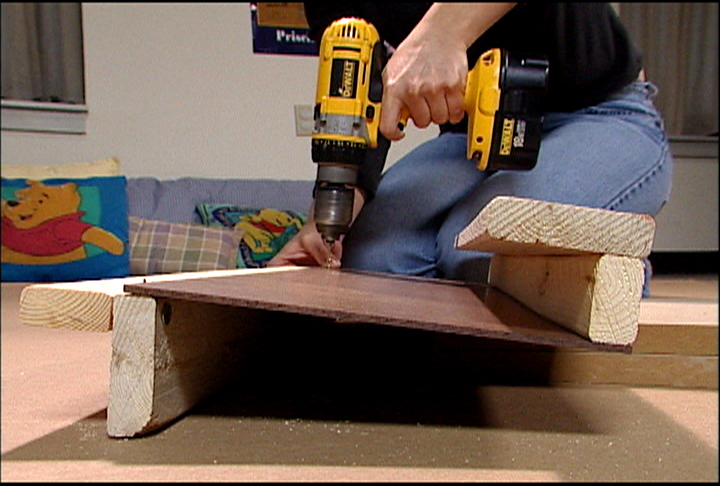 Drill three holes onto the face of one of the 8x24 inch pieces of tempered hard board along the 24 inch side. 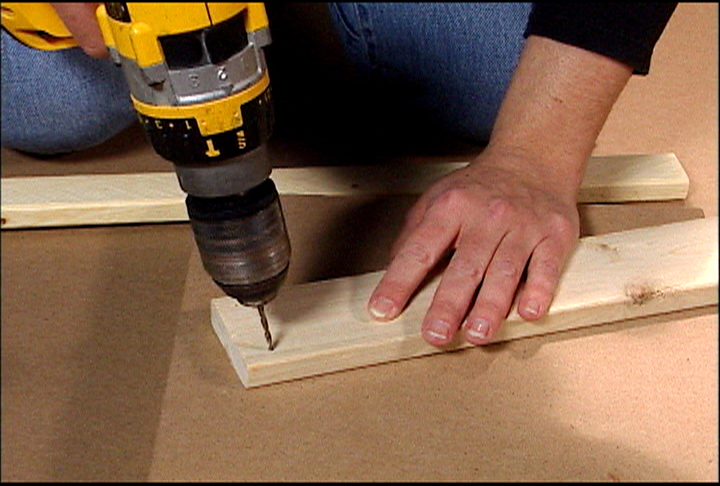 To make the second shelf, drill three holes in the top of the first shelf’s tempered hard board and nail it to the 1x2x2 side of one of the L-shaped boards. 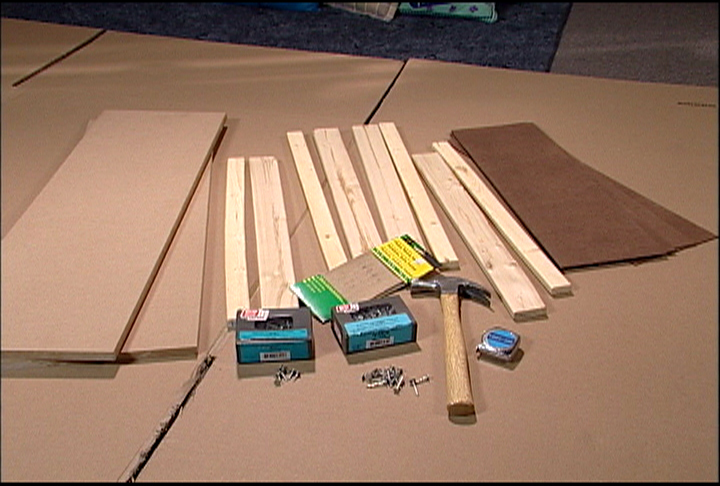 Then connect these to the sides of the MDF shelf by drilling holes in the MDF in each spot where the 1x2x2 and 1x3x2 pieces of wood touched the sides and nailing one nail into each board. 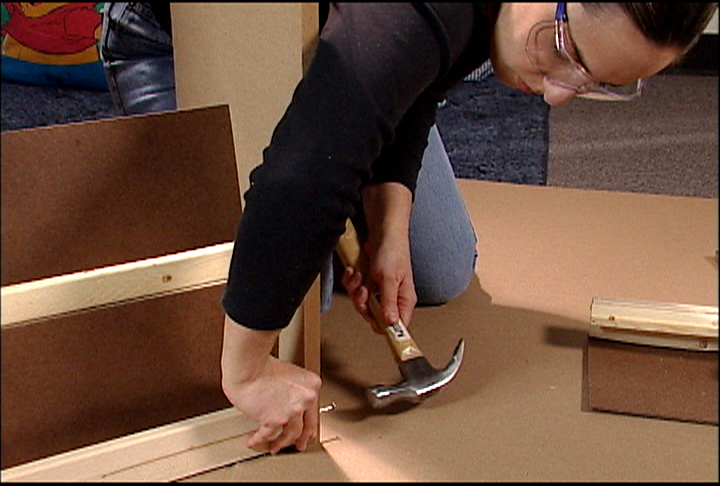 Nail the two sides into place by drilling holes through the MDF and hammering nails into the L-shaped pieces of the shelf. 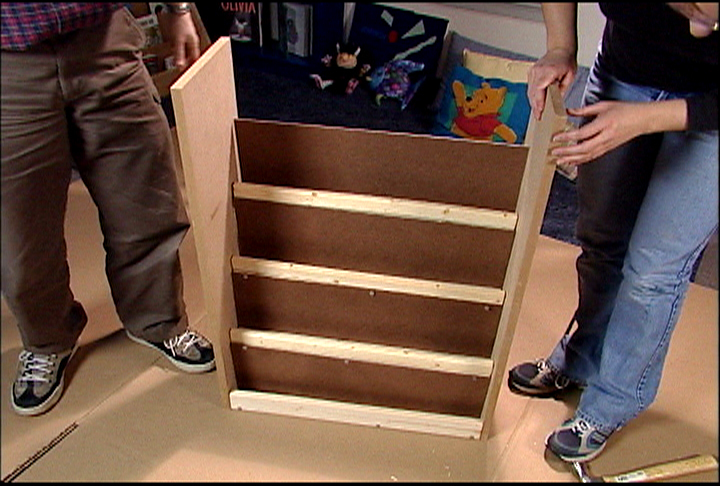 To make the fourth and final shelf, we repeated the steps we followed for assembling the third shelf. Make sure old paint on the shelf is removed or at least safe to be painted over (lead free). Paint the shelf in the darker of your paint colors. Take a sponge, dip it into the lighter paint and blot on a piece of newspaper. Dab the sponge over the shelf to make a decorative pattern. Continue this until the entire surface is decorated. Cover the bookshelf with a high gloss sealer to give it a finished look. Decide where the bookshelf is going to be placed. Find the studs in the wall by knocking and finding the place where it is not hollow or by using a stud finder. Align the shelf with the wall where the studs are. Place the L joint with one side against the wall and one side against the shelf. Screw the L joints into place, placing one at each corner of the shelf. Place other materials in your center to make it a warm and inviting place for the children to read and relax.